I am very satisfied with the blanket! Easy handling! Fits my mare perfectly! Waterproof! 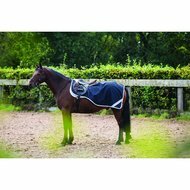 As always a great Horseware blanket. Good fit, stylish design and good quality. Sits very well when riding. I can only recommend the Nierecke! 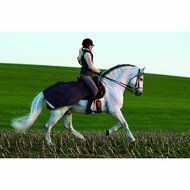 Both for a leisurely ride and in training. She has a very good fit. Very good quality, good fit. Waterproof, pleasant to use. Exercise with good fit and beautiful color. Fine lining. Super handy for the winter. Question: Which blanket size (cm) is size L? Question: Which blanket size (cm) is size S? Answer: That is approximately blanket size 155 to 165. Question: Is this blanket waterproof? What kind of lining is there and how thick? Answer: This blanket is waterproof. This blanket has a fleece inner lining.